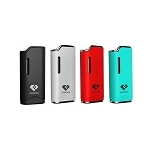 The Yocan Pandon is a slim pen style vaporizer that utilizes quad glass quartz coils to quickly heat through waxy essential oils with the quick touch of a button. Measuring at about 5" tall by just over half an inch thick, the Pandon Vaporizer from Yocan can comfortably slide into your pants pocket for discreet travel. This device utilizes Yocan's quartz dual coil atomizers that offer great efficiency with an extremely clean-tasting quality of vapor. Unlike many other Yocan vaporizers, the Pandon is capable of using either one or two QDC's at a time for full control over your vape experience. 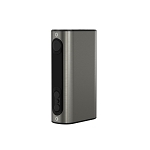 While out in public you may want to use just one to keep it discreet with a thin vapor while at times you may want to maximize your overall vapor output with two, with Yocan's Pandon the choice is yours. The Yocan Pandon's quartz dual coil atomizer heads each come equipped with Yocan's signature coil cap system that helps to prevent waste and ultimately help you to get the absolute most out of your material. These coil caps will prevent any oil from seeping out of the atomizer during the heating process and keep every last bit close enough to the heating element to ensure it all gets vaped, leaving nothing to waste. Yocan's Pandon Battery also features a large 1300mAh capacity that will often provide days of use before eventually needing a recharge. When that time comes simply connect to the included USB charging cable to achieve a full recharge in just a few hours. If you are one who is on the impatient side, the Pandon Vaporizer can continue heating while you recharge so you will never have to wait to vape again. If you are looking to invest in an efficient yet discreet wax vaporizer without breaking your bank in the process then look no further the Pandon Vaporizer from Yocan is just the one for you.